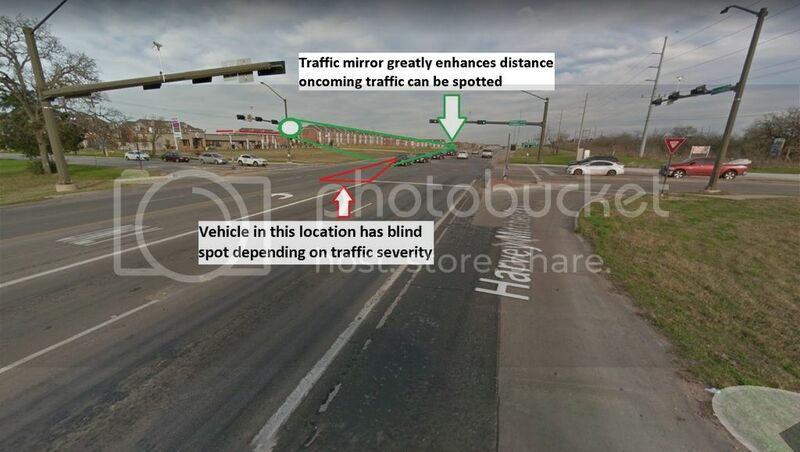 The intersection of Harvey Mitchell Parkway and Holleman Drive has consistently been the location of regular automobile accidents, and modifications to this intersection must be made. After living nearby for a year, I can not recall a week that has gone by where I have not seen an accident here, save for the times where I have been out of town. I'm sure that anyone who is familiar with this location can attest to the accuracy and unfortunate reality of this statement. I have recently submitted a request to TXDOT for a list of accidents from 2012-2017, as well as a request to CSFD for a list of approximate man hours spent by firefighter personnel responding to accidents at this location. I believe this information coupled with community backing will prove to be a mighty voice to our city government as we petition for a safer means of navigating our streets. I intend to introduce this topic at an open city council meeting once I have received sufficient supporting data from several local agencies. Pro - Significant reduction in accident occurrence. Con - Increased traffic through the area as drivers will be forced to wait for a protected turn signal, irritable drivers. The current speed through this intersection coupled with the severe blind spot restrictions has consistently produced vehicle accidents. Many of these accidents are the result of a false sense of security given by the unprotected left turn signal (blinking yellow arrow). While it is ultimately up to the driver to assess and make a sound judgment as to when it is safe to turn, we must realize that errors in human judgement can and will occur, especially with the massive blind spots and high speeds allowed through this intersection. The unprotected turn signal serves as a means to ease traffic flow through an intersection, but once again the speed of oncoming traffic paired with a large blind spot has proven to be deadly. Oncoming drivers are unable to stop in a reasonable time, and drivers who are executing the turn are unable to see oncoming traffic until it is too late. I propose that the unprotected left turn signal be completely eliminated from this intersection and timing adjustments are made to allow a greater timeframe for drivers to turn while protected. Pro - Reduction of accident occurrence by allowing vehicles to come to a stop in a shorter amount of time. Con - Increased traffic, irritable drivers. A reduction in the speed limit of 10mph can potentially allow a vehicle to come to a stop 50+ feet earlier. This reduced braking time can potentially save lives and reduce the amount of vehicle accidents along this roadway. With the huge blind spots imparted on drivers wishing to turn left, a lower speed limit will allow oncoming drivers to brake sooner and give turning drivers a greater chance at performing evasive counter measures should the need arise. I propose a 10 mph decrease in the speed limit at minimum. Option 3. Longer distance that vehicles must stop before intersection when in turning lanes. Pro - Significant decrease to blind spots, reduction in accident occurrence. The lane markings that designate the point at which a vehicle must stop when approaching in my opinion are too close for the left turn lanes at this intersection. Vehicles that are lined up in the turn lanes provide an effective blind spot for drivers wishing to turn. Pushing back the lead vehicle stopping point in the left turn lanes will significantly reduce the blind spot and allow turning drivers a greater field of vision, thus allowing for more accurate judgment calls. I propose that the turning lane stopping point by pushed back 20 feet at minimum. Option 4. Implementation of turning lane mirrors. Pro - Decrease to blind spot by allowing greater field of vision for turning drivers, reduction in accident occurrence. Con - None that I can think of. Implementation of large mirrors on the signaling poles will allow turning drivers to see oncoming traffic before they commit to a turn. This would be a very cost effective way to protect our citizens and would also provide the lowest impact on traffic as it would not require significant modifications to traffic flow and control infrastructure. This option seems like the most common sense way to mitigate this problem and would be easy to implement. I propose a budgetary measure that would allow for the installment of two large convex mirrors in both turn lanes. 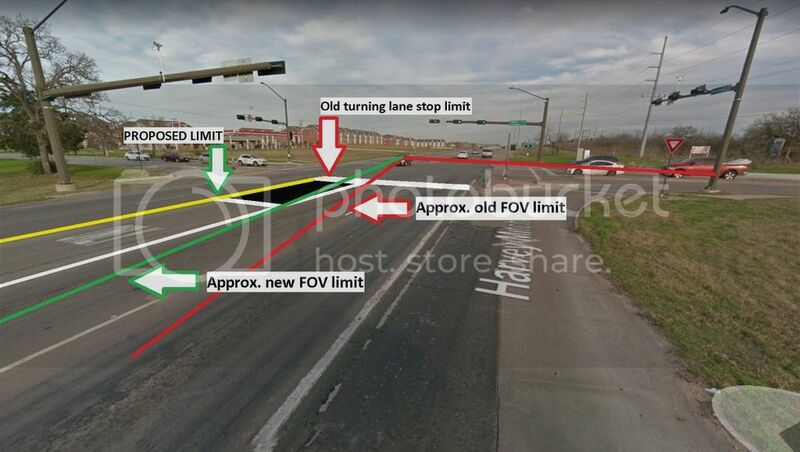 Sterling Classen-Reid needs your help with “Dear City Council: Proposed Changes To FM-2818 / Holleman Intersection”. Join Sterling and 5,996 supporters today.